Finding the perfect tarantula can be difficult, as many commonly imported species (especially from Africa andAsia) are simply too aggressive to make good pets for the beginning or intermediate keeper. The most col­orful American tarantulas tend to be expensive, but if you can find affordable half-grown to adult specimens, they probably make the best pets. Tiny spiderlings are less expensive but harder to care for. After you have become used to caring for a grown tarantula, you may find it easier to care for spiderlings. First, however, let’s try to relieve your fears about whether it truly is safe to own a tarantula as a pet. Tradition has branded tarantulas as venomous killers that would not hesitate to attack a human. This idea has been around for at least three hundred years and is widespread in novels, movies, television, and even some scientific books. (The most widely used book on identifying North American spiders erroneously mentions the “deadly bite” of some South American tarantulas.) 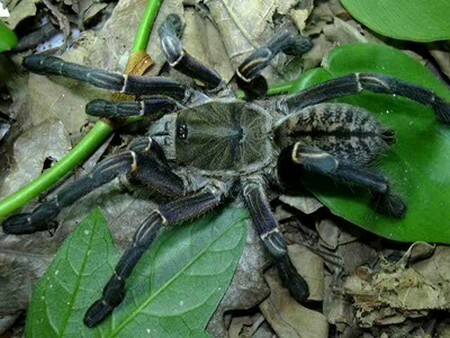 The reality is quite differ­ent, because tarantulas are shy, secretive animals that cer­tainly wouldn’t attack something the size of a human unless cornered with no way to escape. Yes, laboratory tests do show that for some reason tarantula venom is especially toxic to small mice and rats, and this has been taken as evi­dence that a bite may be dangerous to humans. Humans are not mice, fortunately, and experience proves that the bites of most (but not all) tarantulas are fairly harmless. Exceptions occur, however, and there is good reason to believe (though actual scientific evidence is sparse) that American tarantulas belonging to the genera Acanthoscurria, Themphosa, Phormictopus, Tapenauchenius, and Lasiodora could cause more widespread reactions, including short­ness of breath and swelling of an arm, for more than a day. These also happen to be generally aggressive spiders that do not fail to defend themselves if approached. Even more potentially dangerous are many or most tarantulas from Africa andAsia. Though none of the species in the hobby are certain to have caused major human prob­lems, the ornamental tarantulas (Poecilotheria spp.) ofIndiaandSri Lankahave certainly caused severe shortness of breath and uneven heartbeats, reportedly resulting in hospi­talization. The large earth tigers of southernAsia(Haplopelma spp.) are reputed to be just as bad. InAfrica, the feather-legged tarantulas (Stromatopelma spp.) are greatly feared, and there is some evidence that their venom can affect the human heart. Similarly, the very aggressive baboon spiders of southern Africa (Citharischius spp., Ceratogyrus spp., and Pterinochilus spp.) are reputed to cause more than temporary swelling and numbness from their bites and have close relatives (Harpactirella spp.) that are said to have killed humans. It is fairly certain that the release of venom is under vol­untary control of the spider, and only a few bites to predators (meaning you) are likely to release a significant amount of venom. 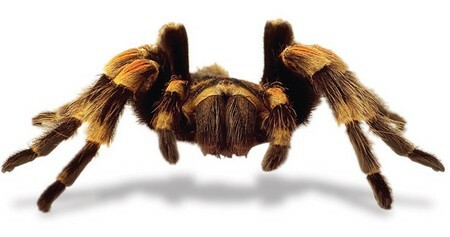 This makes it even harder to determine whether a tarantula truly is dangerous to humans, as anecdotal evi­dence from even many bites doesn’t prove that the venom has had a chance to act. Play it safe if you plan to keep any of these tarantulas; keep their cages securely covered and locked and never handle the spiders. Are tarantulas deadly? No, probably not. Are they danger­ous? Yes, just a few. Make sure to consider the danger potential when choosing a pet tarantula. Your best choices for a “safe” tarantula certainly would be a Mexican red-knee (Bmchypelma smithi) or painted red-leg (Brachypelma emilia), followed by any other Brachypelma species. North American Aphonopelma species and Chilean rose tarantulas (Cirammostola rosea) probably are safe, as are the pink-toes (Avicularia spp. ), if you have enough experience to take care of fast-moving spiders. OfOld World tarantulas, the starburst tarantulas (Pterinochilus spp.) may be safe, though there have been a few reports of localized reactions to bites. Anecdotal evidence casts doubt on the safety of other tarantulas.